Analytical Armadillo: Hipp Organic Formula Brain Claim Banned! An advertising campaign for Hipp Organic has been banned for claiming the product helps develop the brain and nervous system of young children, ruled the ASA. 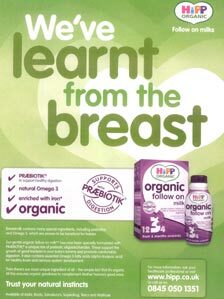 The magazine ad was headlined "We've learnt from the breast" and said the follow-on milk contained essential Omega 3 fatty acids for healthy brain and nervous system development, adding: "All this ensures organic goodness to complement Mother Nature's good work. Trust your natural instincts." The Advertising Standards Authority (ASA) challenged whether Hipp Organic's claim that the milk aided brain and nervous system development could be substantiated. It said that information given by Hipp Organic "was not sufficiently robust to support the product's claims in relation to healthy brain and nervous system development", adding: "We therefore concluded that the ad was misleading." The ASA ruled that the ad must not appear again in its current form and told the company not to use claims in future that refer to children's development and health that do not comply with advertising regulations. The sad thing is that ads like these get seen by many before they get banned! Makes it more important to circulate news such as this and let mums know that all that glitters is not gold! 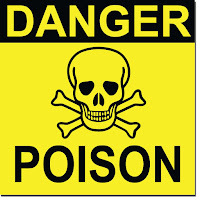 "told the company not to use claims in future that refer to children's development and health that do not comply with advertising regulations. " and what are they going to do if they break it again? Ban it again? Have they got nothing stronger they can do?